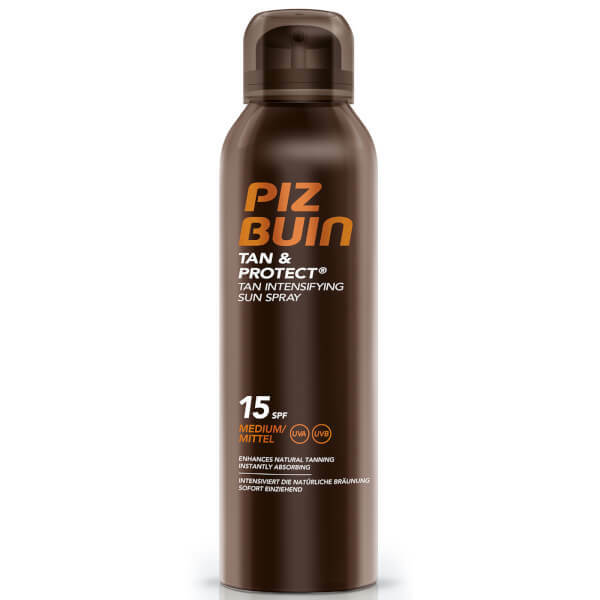 Piz Buin present the Tan and Protect Tan Intensifying Sun Spray SPF 15; a lightweight, non-greasy formula that absorbs quickly and helps to promote a longer-lasting tan. Fortified with an advanced UVA/UVB sun filter system to provide broad spectrum protection, the luxurious spray delivers long-lasting hydration to help prevent peeling, whilst a dose of Illumitone™ enhances the natural tanning process without staining clothes, swimsuits or towels. Apply generously and evenly before sun exposure. A reduced quantity lowers the protection level significantly. Reapply frequently, especially after sweating, swimming or towelling. Avoid midday sun and staying too long in the sun even while using sunscreens. Keep babies and children out of direct sunlight. Do not spray directly into face. For use on face spray into hands and apply. Use caution, as floor may become slippery during use. Aqua, Octocrylene, C12-15 Alkyl Benzoate, Ethylhexyl Salicylate, Butylene Glycol, Isopropyl Isostearate, Butyl Methoxydibenzoylmethane, Bis-Ethylhexyloxyphenol Methoxyphenyl Triazine, Triacontanyl PVP, Acetyl Hexapeptide-1, Caprylyl Glycol, Tribehenin, PEG-100 Stearate, Glyceryl Stearate, Potassium Cetyl Phosphate, Aluminum Starch Octenylsuccinate, Acrylates/C10-30 Alkyl Acrylate Crosspolymer, Disodium EDTA, Sodium Hydroxide, Pentaerythrityl Tetra-di-t-butyl Hydroxyhydrocinnamate, Tocopheryl Acetate, Phenoxyethanol, Potassium Sorbate, Parfum.